Power Up Your Game With This Intense 5-Day Football Workout! 5 great workouts for football. As a football coach, I also incorporate these into my strength training program. Try these workouts and watch your progress take off! In this article I would like to lay the foundation for a new workout I have been making great progress with. Every person that has used this workout has put on an amazing amount of size as well as strength gains like nothing before. After turning 40 and believing that the best was behind me I proved myself and anyone who thinks 40 means it's downhill ... well baby, lookout! Not only did I compete successfully at the semi-pro football level the last couple of years (I just turned 43 in Aug), but I also lifted weight in exercises that were from 10-15 years ago - I benched 500 lbs for 3 reps, did a single with close to 600 lbs, did squats with 600 lbs for sets of 6, and inclined well over 400 lbs for reps! 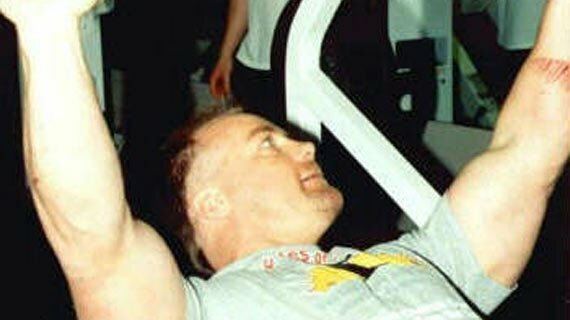 Mitch Hodge performing the incline bench press. I know what your thinking, Mitch hooked up with the gym doc and started a cycle of those secret supps. Oh ye of little faith! I did supplement with creatine, NO2 and tribulus as well as a good weight gainer (I buy the Higher Power (now Bodybuilding.com Supplements) brand for the cost and effectiveness). However, the biggest change was in my workouts. I was starting to feel it in my joints as well as just not getting the results I expected! After some serious prayer and contemplation I felt inspired to write out a new program. After the initial pouring out of the workout itself I was surprised at the simplicity and common sense that went hand-in-hand with this workout. I will lay out basic sets and reps, but first a little common sense explanation. Most of the time we blast a body part or two and wait a number of days before we do it again. The problem is that it is such a guessing game of just how long we need to wait after one particular body part in order for the next time we hit that area for it to be effective. The uniqueness of this workout is that no major body part is killed in any one day, instead it is hit over a few days in succession. The larger body parts (legs, chest, back) are usually done over two days. Whereas arms, for example, are done over several days so they can be killed but not OVER KILLED for max gains. I am also a football coach and our strength training program is using this workout right now. I have several young men making great gains as well as many women in my gym. Try this workout for at least 4 months and then take a short break (a few weeks) from the high intensity training before continuing. "I'm sure I'll receive plenty of emails on the fine tuning aspects, just remember to use the first 12 as a good warm-up and increase weight to a point of near failure for each set after - The last 12 should be 10-20% heavier than the first set of 12. Good luck and may the Lord bless all your efforts!" -Mitch Hodge "The Hammer"
Football Performance Greater With Powerlifting Rep Method! Football Preparation: Peak Performance Training & Nutrition Overview! Mitch Hodge - Mr. USA and Mr. America competitor! Current Power Team Member. How does he do it?